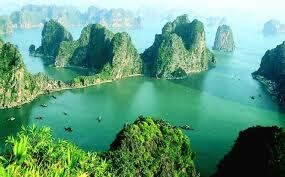 Halong bay is a famous beautiful sight in the Northeast sea of Vietnam, located in Quang Ninh province. 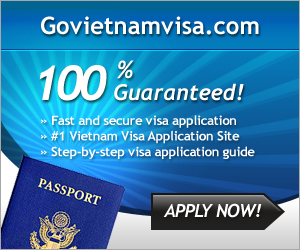 It is 151 kilometres further from Hanoi to the east of Vietnam. This is national tuorist attraction is recognised by the UNSESCO as the world natural heritages. Halong bay features more than a 2000 limestone karsts and is dotted with islands of various shapes and sizes. The bay is situated along the coastline of Bai Chay Beach, and features more than 120 kilometers of open coastline. Magnificient Halong Bay, with its 300 limestone islets rising from the clear, emerald waters of the Gulf of Tonkin, is one of Vietnam’s natural marvels. The name of Ha Long Bay literally means the Descending Dragon Bay in Vietnamese. According to the legend, the islands were formed by the swish of dragon’s tail. A short journey through the misty sea quickly spurs romantic imaginations redolent of this tale. There are plenty of exciting activities and exploration options available in addition to relaxation and comfort. Every island, cave, and beach in Halong is unique beauty. Halong Bay is made up of 1,969 islands of various sizes, 989 of which have been given names. There are two kinds of islands, limestone and schist. This is a legendary world just waiting to be explored. Large waves are rarely seen in Halong bay. The sea water is as blue as sapphire – like. The climate is warm, cool and pure and untouched. Halong has a special appeal to tourist with its magnificent, charming and poetic beauty. Halong’s scene is never monotonous but always new from different angles, views and keeps changing over time. There are many choices for travel on the bay from small day cruisers to traditional style junk boats some of which have been completely decked out with all the modern luxuries. No matter how you see the bay, don’t miss the chance to go for a swim especially during the spring and summer when the waters are crystal clear. Several of the islands have caves and small alcoves with charmingly tiny sandy beaches which can be explored by the small vessels most tour organisers carry on the boats. Tourist to Halong in any season of the year also find its fasanating beauty and charming. Taking a Halong Bay junk boat cruise is an experience that will allow you to truly enjoy the natural wonders of Vietnam. Whether you want a romantic long weekend filled with some of the world’s most beautiful scenery or you are looking for an exciting way to explore this diverse ecosystem, a Halong Bay junk boat cruise is a trip that you will never forget. Halong bay is a sea islands in tropical wet which is featured humid tropical charactor with 2 seasons: hot and moist with much rainning in summer, dry and cold in winter. The climate is warm, cool and pure and untouched. 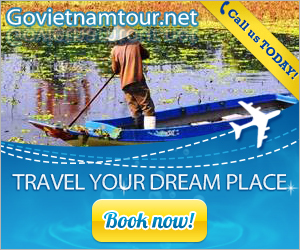 Like other cities and provinces in Vietnam belonging to the tropical region, average temperature is from 15°C- 25°C. Annual rainfall is between 2000mm and 2200mm. Halong bay has the typical diurnal tide system (tide amplitude ranges from 3.5-4m). Temperature reaches the highest point in June (28,6ºC) and reduce to the lowest point in January (16,7ºC). The annual air humidity is around 82,7%. The best time of year to visit Halong Bay is during the spring or fall. Because the bay is situated in the northern part of the country, it can get colder in the fall and winter, and though you won’t see extremes such as blizzards, it’s still a lousy place to be when it gets cold. By Helicopter: flight time is 1 hour, cost US$ 210 / hour. Available only on Saturday Only from Gia Lam Airport in Hanoi. By private car, minibus or bus: The best way to travel to Halong bay is to rent or hire private car, minibus or bus with a driver, the drive takes approx 3,5 hours one way, cost about US$80 to 120 one way/trip and US$ 150 to 200 for return trip depend on the type of vehicle. The other way: You can go is from Hanoi you then take the private car, bus or minibus to Hai Phong, drive time 2 hours costs US$70 to 80/one way. Then from Hai Phong you can take the hydrofoil to Cat Ba island, 1 hour speed boat ride and cost US$10 per person. Schedule are 9am and 11h30 am from Hai Phong, from Cat Ba is 3:00 pm., in Cat Ba you then hire the boat to see Halong Bay right after you arrival. The best way to see Halong bay is to board the boat and cruising around among stunning rocky islands, the boat cruise range from 1, 2 or 3 days and some time up to 10 days depending on the travelers request. Shopping in Halong provides tourists with plenty of items to take back home, for their near and dear ones. The charming city of Halong in Vietnam sells all that is typically Vietnamese, from silk fabrics to ceramic sets to jewelry. Shopping in Halong gives a visual treat into the richness of handicrafts of Vietnam, which is popular throughout the world. Night market in Bai Chay town should be mentioned firstly. It is set up with many small open-air stalls with good collections of Vietnamese products includes the famous traditional Vietnamese silk dress (ao dai), lacquerware, chopsticks, trinkets, ceramic tea sets, Vietnamese conical hats (nón lá) and dolls. Another fun way of shopping is from small floating shops. It could be a surprise for you when seeing local people selling products on a small boat. Such floating convenience stores can catch your eyes immediately when you are on junk boat tours in Ha Long Bay. Local people row boats filled with goods such as beer, vodka, cigarettes, potato chips, cookies and other snacks. Their small boats are usually laden with goods in a very organised way and even if you’re not buying anything these vessels are fascinating to see and photograph. When traveling to Ha Long bay, you should not miss the chance to visit Ha Long market. Situated at the central of Ha Long city, the market is popular for its fresh and cheap seafood. Especially, you can taste some delicious Vietnamese fast food such as hot squid ball. Another speciality of Halong is Tu Hai (Vietnamese: Tu Hài). It is the speciality of Van Don Island district, some other places called snail spout. It is a kind of shellfish, but it is very rare and valuable. If you have enjoyed it once time, you will never forget the special taste of it. You can cook soup or salad with “tu hai” or you can steam or bake it. Steamed “tu hai” is sweet and cool. Its meat mix with spice can attract any visitor when he comes here. 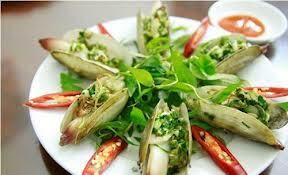 Once mentioned to the cuisine of Halong, you can not miss the “sa sung”. Sa sung (Vietnamese : Sá sùng) is a kind of sea worn. It always lives in sea area of Quang Ninh, Hai phong, Con Dao ,.. It lives in deep hole, under sand, and its color is blow red. Sa sung is 10-15 cm in length. Its shape is similar with earth worm but it is bigger. In its bowler is full of sands. People here usually catch them on early morning. There are many way to cook “sa sung”. You can use sa sung as dried shrimp to cook with noodle soup, vermicelli, fried or baked. Sa sung has its natural sweet taste, so you do not have to add sugar or glutamate. You only add a little salt. Beside the seafood cuisine, you can try “gat gu”, a famous cake in Quangninh. “Gat Gu” (Vietnamese: Gật gù) cake is similar with steamed rolled rice pancake. It is made from rice flour. When making this kind of cake, the maker have a secret to make it more delicious by adding cold rice. After being done, when we take this kind of cake, it nods repeatedly. “Gat gu” cake is quite special and delicious.